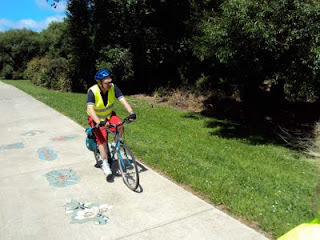 This last weekend was the Christmas Parade through Te Atatu Peninsula, so four of us took the opportunity to dress up our bikes and hit the streets. Unfortunately we weren't part of the actual parade, but we made the most of the empty main road and the crowds and cycled up and down in front of everyone before the parade started, until we were SHOOED off by an officious gentleman in uniform! 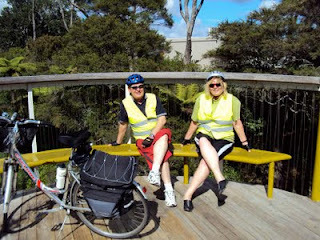 Yesterday, John and I cycled from Te Atatu to Henderson and then I showed him the Twin Streams cycleway, which is great. 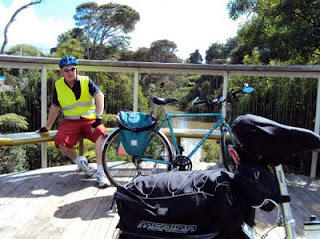 This is us resting on the bridge across to the Falls - which has been closed due to vandalism for the last month or so. 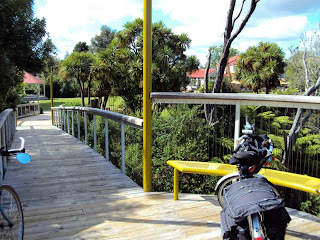 Nice to finally get across but it would be nicer if they replaced the splendid light shades that were either smashed or taken. 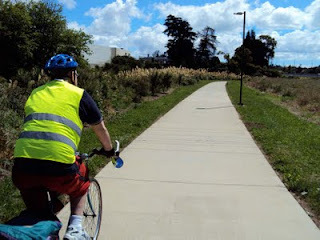 The Twin Streams cycleway has the occasional tile and ceramic work embedded in the path. Stopped at 'Just Plane Interesting' for coffee before heading back. 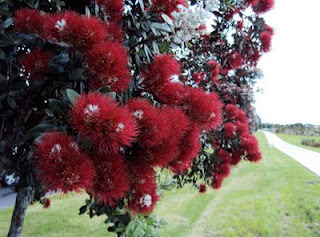 The Pohutukawa are all out and make quite a show on the side of the new Te Atatu cycleway. Merry Christmas All!